Mt. 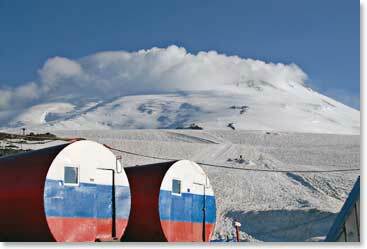 Elbrus Expedition Dispatch: July 20, 2009 – Summit Success! 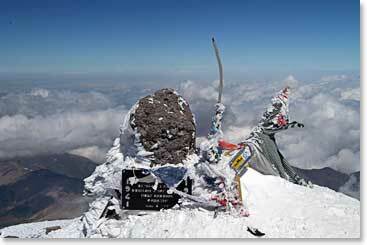 An excited Karina called us this morning to report that at 11:30 AM, Richard, Nicky, Vladimir and her had stood on Europe’s highest summit, Mount Elbrus, together. Later Richard told us that he thought the weather had not been the greatest near the top, but he did say that they felt fortunate to have no wind. And of course the satisfaction in Richard’s voice as we spoke to him from the barrels said it all: they made it! Karina had called the snowcat for 4:00 AM. As you know the weather has been somewhat unsettled for the team in recent days. There was some indecision about whether this morning would be the best day, but in the end the team decided that even though they had more days to wait, the weather might indeed worsen and their best shot was today. They were right! 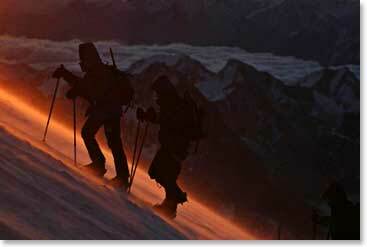 In the early morning they climbed in perfect weather, with visibility deteriorating as they neared the top. Congratulations to Nicky and Richard! We know that they will be enjoying a return to the valley, lower elevations and warmer weather (not to mention hot showers at their hotel!) Stay tuned in coming days for more of their reports from Russia's Caucasus Mountains.